Lack of water forced us to go in search of other activities. 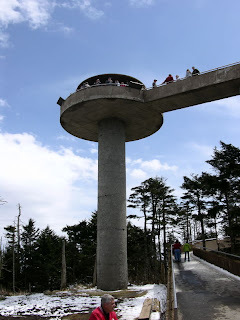 Our Adventure mobile took us to the Smokey Mountain National Park. Smokey National Park is the largest park in East North America…the scenery is breath taking. While the weather wasn’t exactly scorchio, it was certainly warmer than any where else we had been. 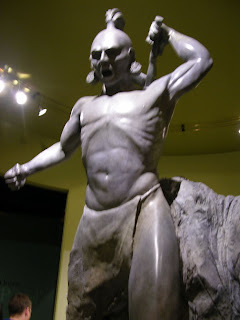 We began our tour at the Cherokee Indian reservation, which boasted Santa land (Theme park and Zoo) and the enormous Harrah’s Casino…we searched for something a little more traditional and opted for the Cherokee Heritage Museum, which provide a great insight into the Cherokee heritage. 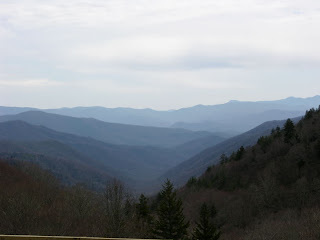 From there we traveled the Newfound Gap Road along with 100’s of other Tourists. The winding road takes you through the heart of the Smokeys. We stopped for a small hike/ stroll to the highest peak at 6643 the second highest peak in the east. To Cheryl’s dismay it was a 0.5 mile hike to the top along a concrete trail and at the peak a ghastly concrete look out tower. The excitement of the day were two Bear Jams…not Bears in jars, but cars causing jams in the roads to view bears…amazing how close they were…very cute and cuddly. Day 2 in the North Smokey Mountains, and we decide to do two hikes one to Laurel Falls and a second to Chimney Tops an impressive aggressive steep hike among huge trees to a sheer sided rock face known as Chimney Tops. The climb to the top was amazing, sadly there was no view to see….only clouds. Thankfully that also obscured the sheer drops..
Day 3 And we moved to the West Smokey Mountains. We decided to do a 11 mile bike ride around a loop known as Cades Cove. This is much less mountainous than the rest of the Smokey’s park, and has been maintained as a ‘Settlers’ era exhibition of houses and buildings. This loop tour is closed for cars on certain days, but not today, so we had to crawl round in a procession of cars, most of which were more concerned with wildlife viewing than cyclist safety. 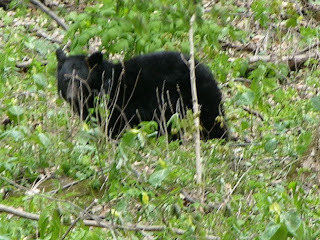 We didn’t see too much wildlife, no more than we’d see in the Vermont countryside…. This was our final day in the Smokey mountain, with some Dam release rivers coming up this weekend!! 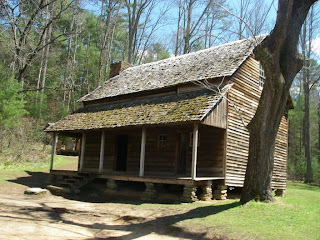 More pictures on webshots – Smokey Mountains and Cades Cove Albums.